Chic Fuel : CIBC Run for the Cure! 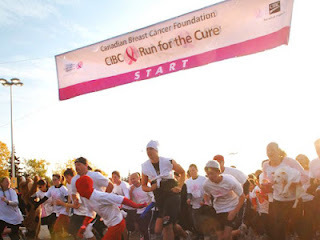 The Canadian Breast Cancer Foundation is hosting a walk/run 1K or 5K event on Sept 30, 2012. This event is dedicated to raising funds for breast cancer research, education and awareness programs. Last year Canadians raised $30 million in the 2011 Canadian Breast Cancer Foundation CIBC Run for the Cure. We all know someone who has had breast cancer. It is a reality and it affects so many lives. Come out to this event to help raise awareness, gain more support and end breast cancer! Breast cancer survivors, along with their family and friends, are invited for a moment of inspiration and support by gathering for the candle ceremony at the conclusion of the Awards Ceremony. Also, if you do not want to participate in the physical part of the event, just come out and volunteer!